A pressing issue facing policymakers around the globe today is how to generate long-term economic growth through technological innovation. While breakthroughs of the past such as the railroad, electricity, and the automobile led to significant progress, growth may be slowing down in recent years as new innovations are becoming increasingly hard to find (e.g. Jones 2010, Gordon 2016, Bloom et al 2017). Given rising levels of inequality, especially in the US, well-targeted innovation policies also need to ensure that growth is inclusive. Because economic growth stems from long run changes, historical analysis can be especially informative. In a recent study, we cover one of the most important eras in US economic growth – the golden age of innovation spanning the late 19th and early 20th centuries (Akcigit et al. 2017). This time period was associated with great inventors such as Alexander Graham Bell, Thomas Edison, and Nikola Tesla, who all produced new inventions that profoundly shaped how Americans lived their daily lives. It was also a time of rising income inequality. In the late 1920s, the top 1% of families received about the same share of pre-tax income as they do today (Piketty and Saez 2003). To study the main drivers of innovation during this period we constructed a new dataset linking several million US patent records over the 19th and 20th centuries to several hundred million individuals listed in Federal Censuses between 1880 and 1940, and to state- and county-level economic aggregates. In our data, inventors accounted for a tiny fraction of the total population – just 0.02%. Yet, the knowledge they produced was strongly related to economic growth, as shown in Figure 1. For example, between 1900 and 2000 a state like Massachusetts (MA) had four times as many patents per capita as Wyoming (WY). Our estimates imply that over a century, MA would be 30% richer than WY purely because of its higher degree of innovativeness. 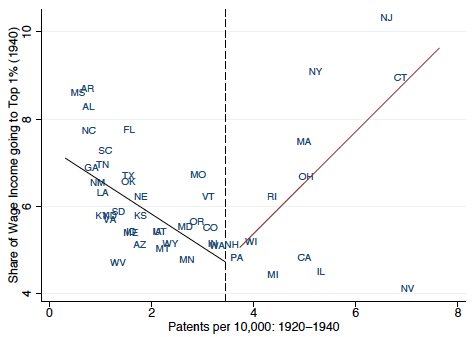 Notes: Figure plots the total number of patents granted to inventors in each state between 1900 and 2000 on the horizontal axis, and the annualised growth rate in state GDP per capita between 1900 and 2000 on the vertical axis. Both horizontal and vertical axes plot the variables of interest residualised against 1900 log GDP per capita, to control for conditional convergence. Our study reports macro- and micro-level findings in relation to innovation and growth. 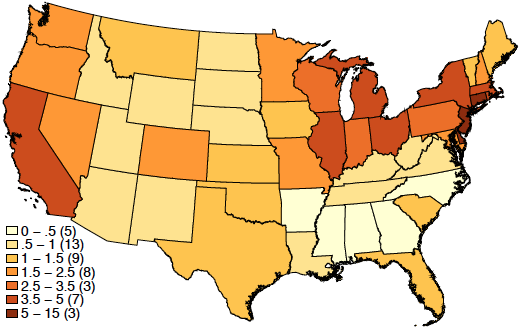 Figure 2 shows the geographic distribution of inventive activity in the US in 1940. From a macro-level perspective, we highlight the key characteristics of innovative states and counties, and we also show that inventors tended to migrate to places that were most conducive to innovation. We find an important role for population density, which is consistent with the large literature linking innovation to clusters of people, firms, and ideas (Glaeser 2011). Financial development was strongly positively correlated with innovation at this time, supporting the major hypothesis of finance-related growth (King and Levine 1993). Geographically connected states were more inventive, especially those on the East Coast and in the Midwest where economic activity was focused, which is consistent with market access being a driver of US growth (Donaldson and Hornbeck 2016). We also examine social structure. States associated with slavery were unambiguously weaker in terms of innovation. Discrimination limits openness to disruptive ideas (Acemoglu et al. 2014) and stifles growth due to the misallocation of talent (Hsieh et al. 2016). We find some evidence of a negative effect of religion on innovation, though not as strong as the negative effect found for the modern era (Benabou et al. 2015). Notes: Figure maps the number of patents (Panel A) or inventors (Panel B) per 10,000 residents in each state of the mainland US in 1940. Darker colours represent more inventive activity per resident. Our linking of historical patent records with the Federal Censuses permits analysis of the micro-level determinants of innovation, including features of the upbringing of inventors and their life cycle. We show that inventors were not typically amateur tinkerers – rather, they tended to be highly educated people who were positively selected on inventive talent early in their careers. They were mostly white males, who delayed marriage and had fewer children than the general population, perhaps to focus on their craft. Indeed, the financial return to technological development was large and increasing in the quality of innovation. Whether growth is inclusive depends largely on the extent to which new technologies are produced by the population at large or just by privileged groups. This is currently a major point of policy debate, given the need for innovation interventions that maximise society’s potential for producing creative ideas (e.g. Aghion et al 2015a). According to Bell et al. (2015), talented individuals from low-income families find it disproportionately hard to access careers in invention. Our historical data on inventors provides perspective on long-run trends for this aspect of US society. A major set of findings in our analysis relates to family background as a determinant of entry into an inventive career. Figure 3A shows the propensity to become an inventor by father’s income percentile in the 1940 Census. The advantage to individuals from very high income brackets is strikingly similar to the findings for recent years in Bell et al. (2015). This correlation can also be seen in data for Finland too (Aghion et al 2015a), suggesting that it is a key stylised fact on the backgrounds of inventors across time periods, geographies, and institutions. 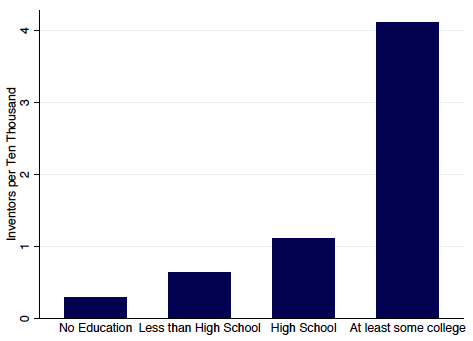 Figure 3B highlights the importance of education. It shows a clear link between increasing educational levels and the probability of becoming an inventor. From a policy perspective this suggests that equal access to education is important for innovation and economic growth. Notes: Figure plots the number of inventors per 10,000 people by their father’s percentile of wage income in the 1940 census (Panel A). Only individuals successfully matched to their fathers are included. 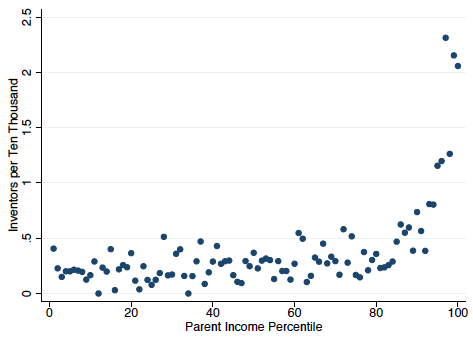 Wage income percentiles are calculated using the full sample of matched fathers. Panel B shows the education of inventors in the 1940 census. We also investigate the mechanisms driving these results and the consequences over the life cycle of inventors. We find that having a father as an inventor increased the probability that an individual would become an inventor themselves. Yet, these individuals did not generate more (or higher quality) inventions than their counterparts who did not have an inventor as a father. This suggests that barriers to entry such as capital constraints, or access to the right social networks existed in the inventor labour market. Furthermore, while the father’s income was positively correlated with entry into invention, we show the effect disappears when controlling for the child’s own education. This finding suggests better off families invested in the human capital accumulation of their children, which created advantages later in the life cycle. Our data shows well-educated inventors tended to outperform the less-well educated in terms of career patent and citation counts. Finally, we also explore the societal consequences of innovation through the lens of inequality. Technological change can deliver growth in ways that would imply more or less inequality. On the one hand, innovation (by entrants) creates catch-up and more competition and therefore leads to a negative relationship (Jones and Kim 2014). On the other hand, innovation generates monopoly power in society and hence can generate a positive link between inequality and innovation (Aghion et al. 2015b). Figure 4A supports the former theory. We find a strong negative relationship between our measure of innovation and the Gini coefficient as a broad indicator of income inequality. Figure 4B supports both theories. 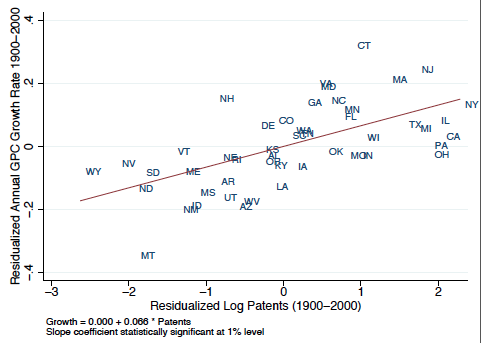 Among states where intellectual property is more likely to be important, we observe a positive link between innovation and the share of wages earned by the top 1%. These contrasting findings are important because they illustrate that the relationship between innovation and inequality varies according to the measurement approach used. This underscores the need for analyses like ours that attempt to understand the complex relationship between a society’s social structure and outcomes in the real economy. 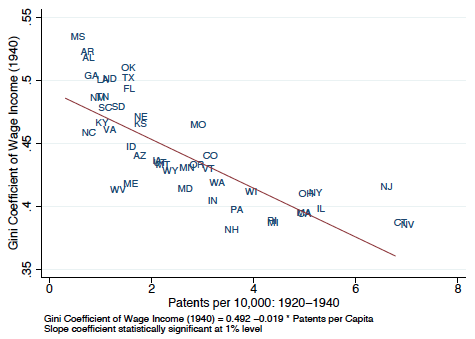 Notes: Figure plots the relationship between average patents per 10,000 residents between 1920 and 1940, and 1940 state-level wage income inequality, measured by the share of income controlled by the Gini coefficient (Panel A) and the top 1% of the state’s wage earners (Panel B). Although technological progress is generally accepted to be the key to modern economic growth (e.g. Romer 1990, Aghion and Howitt 1992), we still know very little about the background and careers of the most effective inventors. We analyse patents, economic aggregates and Federal Census records in an attempt to shed light on a major epoch of innovation in US history, which has implications for how we think about innovation policy today. During the late 19th and early 20th centuries, many of the leading technologies that we still rely on like light bulbs, air conditioners, and storage batteries were first developed. Our macro and micro-level findings can contribute to the design of innovation policy by presenting complementary evidence on the life cycle of invention to modern studies like Aghion et al. (2015a) and Bell et al. (2015). While our study shows that technological progress causes growth, it can also be related to social dislocations in the form of inequality. How innovation relates to growth and inequality in the past as well as the present is central to the formation of inclusive policies. Acemoglu, D, U Akcigit and M A Celik (2014) “Young, restless and creative: Openness to disruption and creative innovations”, NBER, Working paper 19894. Akcigit, U, J Grigsby and T Nicholas (2017) “The rise of American ingenuity: Innovation and inventors of the Golden Age”, NBER, Working paper 23047. Aghion, P and P Howitt (1992) “A model of growth through creative destruction”, Econometrica, 60(2). Aghion, P, U Akcigit, A Hyytinen and O Toivanen (2015a) “Living the American dream in Finland: The social mobility of innovators”, University of Chicago, mimeo. Aghion, P, U Akcigit, A Bergeaud, R Blundell and D Hemous (2015b) “Innovation and top income inequality”, NBER, Working paper 21247. Bell, A, R Chetty, X Jaravel, N Petkova and J Van Reenen (2015) “The lifecycle of inventors”, Harvard, mimeo. Benabou, R, D Ticchi and A Vindigni (2015) “Religion and innovation”, NBER, Working paper 21052. Bloom, N, C I Jones, J Van Reenen and M Webb (2017) “Are ideas getting harder to find?”, Stanford University, mimeo. Donaldson, D and R Hornbeck (2016) “Railroads and American economic growth: A market access approach”, Quarterly Journal of Economics, 31(2): 799–858. Glaeser, E (2011) Triumph of the city: How our greatest invention makes us richer, smarter, greener, healthier, and happier, Penguin. Hsieh, C-T, E Hurst, C I Jones, and P J Klenow (2016) “The allocation of talent and US economic growth”, NBER, Working paper 18693. Jones, B F (2010) “Age and great invention”, Review of Economics and Statistics, 92(1): 1–14. Jones, C I and J Kim (2014) “A Schumpeterian model of top income inequality”, NBER, Working paper 20637. King, R G and R Levine (1993) “Finance and growth: Schumpeter might be right”, Quarterly Journal of Economics, 108(3): 717–737. Piketty, T and E Saez (2003) “Income inequality in the United States, 1913-1998”, Quarterly Journal of Economics, 118(1): 1–41. Romer, P M (1990) “Endogenous technological change”, Journal of Political Economy, 98(5): S71–102.